the xray doctor: xrayoftheweek 49: what does this MRI sequence tell you? xrayoftheweek 49: what does this MRI sequence tell you? 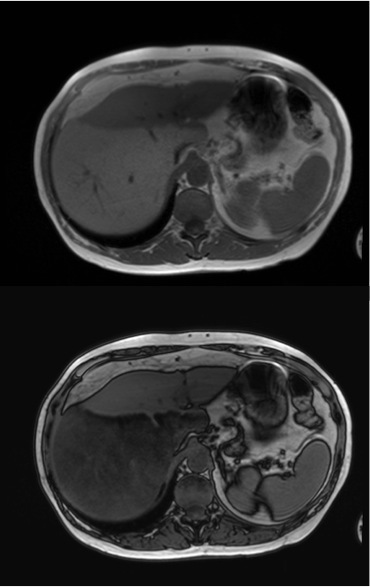 The #xrayoftheweek is this panel of two images from a liver MRI - this is a specific sequence which provides the answer to the odd appearance of the liver. 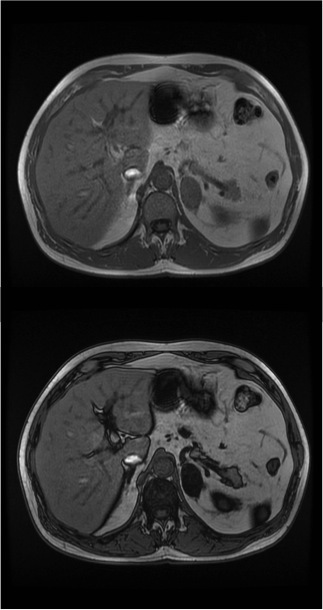 Which sequence is this and what is going on in the liver? These are T1 weighted in and out of phase images, and they indicate gross fat infiltration within the right lobe of the liver. The protons within hydrogen atoms spin at different frequencies in fat and water. Just like the hour and minute hand of a clock, during one cycle, they will line up together once and be opposite to each other once. On a 1.5 Tesla MRI scanner, this cycle takes approximately 4.4 milliseconds. So, every 2.2 milliseconds, the protons are lined up opposite to each other, and every 4.4 milliseconds, they are aligned. In other words, every 2.2 msec, they are out of phase, and every 4.4 msec, they are in phase. This property can be exploited to look for high fat content within tissues. The TR is kept constant (read more about the TR and TE here) and two sets of images are obtained with TE of 2.2 (out of phase) and 4.4 msec (in phase). If there is a significant fat content in the tissue, the signal from the out of phase image will be lower. This phenomenon also gives rise to the India Ink artifact which is a cartoon-like line around the edge of structures on the out of phase images, due to voxels which contain both fat and water at the interface of various tissues. In the images above, there is a sharp demarcation between the left and right lobes of the liver. The top image is the in phase image, and the bottom one is the out of phase image. Between these two, there is a marked reduction in signal intensity in the right lobe on the out of phase image, indicating that there is a lot of fat in the right lobe. Paradoxically, within the left lobe, the signal appears to increase between the in phase and out of phase images. This has been reported to occur in conditions such as iron overload. However, care should be taken to check the actual signal intensity as the contrast against the marked change in the right lobe may make the signal in the normal left lobe look like it increasing when in fact is is normal.